The Suburban Farmhouse: Bringing back slow food, DIY kitchen projects, and other goodies from a bygone age with a special emphasis on being accessible to a modern lifestyle. We ran into 2 issues last weekend 1) It's STILL cold outside and 2) there was no room in the freezer for the stuff we bought for our 1st barbeque of the year. So, I purged the freezer and found 3 chicken carcasses to make stock and a great big ham bone left over from Easter. Good thing I have more than one stockpot! As much an I hate to admit it, my shivering body is telling me that it's still soup season, regardless of what the calendar is telling me. This recipe for white bean, kale, and ham soup holds a special place in my heart. The first time I came up with the idea was when I was pregnant with my first daughter and feeling more than a little morning (all day) sickness. The sweetness of the ham and the texture of the beans were apparently just right and this soup was the only thing I could stomach for about 2 weeks straight right around Easter time that year. Combine beans, water, salt, hambone, carrots, celery, onion, bayleaves, and black pepper in a large stock pot. Bring to a boil and then let simmer for 2-3 hours. About 10 minutes before you're ready to serve, add kale and stir. The Sourest Pickle, my second book, is on Amazon! Click the picture above to purchase! 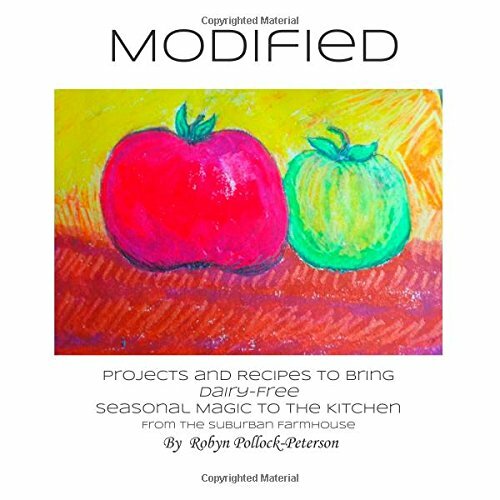 Modified is available on Amazon! Support my blogging habit! Click the picture above. Pickled Whole Cabbage Leaves : Amazing Stuffed Cabbage On Deck! Super-Party finger food starring Daiya "creamcheese" : Who says there's no such thing as allergen-free fingerfoods? Wonton Soup and DIY "Chinese Stock"
Copyright 2014 Robyn Pollock-Peterson. All Rights Reserved. Powered by Blogger.